Thank you to everyone for making Chinese New Year Celebrations so successful and so much fun. 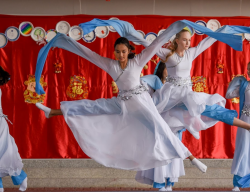 The performances from our youngest to oldest students gave us a glimpses of traditional Chinese dances as well as the upbeat China of today. The overwhelming feature was the confidence and enjoyment of the children as they smiled their way through their performances. Well done to Milo and Mimi who were so relaxed and professional as our comperes. The surprise appearance of the Dragons was a very fitting finale to the spectacle. We were then treated to traditional Chinese games and food in the fair. Thank you to Ms Bonnie, Ms Hong and to the parents and grandparents who came to help with the stalls. It was a most enjoyable event. This year’s UK Safer Internet Week begins on Monday 4th February 2019. HHIS will be supporting the aim to promote the safe, responsible and positive use of digital technology for children and young people. We teach safe use of the internet throughout the school and through the year, of course but supporting this UK national initiative helps to boost the message. I know it is a concern for parents so we would like to invite you to join us at 3:45pm on Wednesday February 6th for a workshop on this important subject. The workshop for parents will be led by Mr Matt and Mr Lewis and will be held in the Year 5M Classroom. We look forward to welcoming you. We will be hosting a book fair in school from Monday February 4th to Tuesday February 5th and parents are welcome to come and browse the books with the children. I know that everyone has been concerned about the reports of high levels of the pollutant PM2.5 in the air of Bangkok and it’s surrounding areas. We now have an air quality sensor to track our own air quality at school and will act accordingly should noxious levels rise. Since we have had the meter, the readings have not risen above a PM 2.5 level of 45. We will continue to monitor our air quality and respond appropriately if conditions change. I would like to invite parents to a meeting on Wednesday February 13th at 8:30am so that I can provide an update on developments of HHIS and also respond to any other questions you may have. These meetings are a good way to share information with you and further support the partnership that we enjoy with our parents.Please do come in you can. Our sports teams have a busy week ahead with a football match on Friday and the ‘Sprint Challenge’ event for our swimming team. Our school calendar for 2019/20 is attached to this letter.